Amid word of yet another Russian space failure -- the fifth this year -- a Russian Soyuz ferry craft glided to a problem-free docking with the International Space Station Friday, boosting the lab's crew back to a full complement of six after an August launch failure that disrupted crew rotation flights. With Soyuz TMA-03M commander Oleg Kononenko monitoring an automated approach from the spacecraft's center seat, flanked by European Space Agency astronaut Andre Kuipers on his left and NASA astronaut Donald Pettit to his right, the docking mechanism at the forward end of the ferry ship engaged its counterpart on the Rassvet docking port at 10:19 a.m. EST (GMT-5). "We have contact. 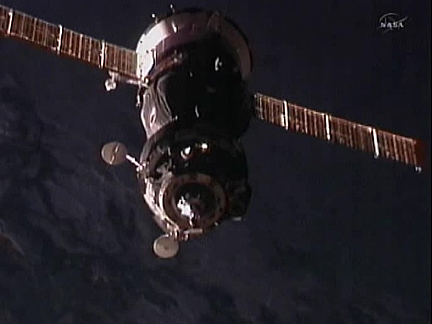 We have capture," someone said in Russian as the Soyuz gently contacted the docking port. A few moments later, hooks and latches in the docking mechanism pulled the Soyuz snugly into place for a series of leak checks to verify an airtight seal. About two hours later, Expedition 30 commander Daniel Burbank, Soyuz TMA-22 commander Anton Shkaplerov and flight engineer Anatoly Ivanishin, who arrived at the station Nov. 16, welcomed their new crewmates aboard. After the usual hugs and handshakes, all six gathered in the Zvezda command module for a congratulatory call from dignitaries and family members in mission control near Moscow. Pettit's twin sons, Evan and Garrett, wished their father good luck and Merry Christmas and his wife, Micki, called to say "just wanted to tell you your launches do not disappoint. It was absolutely beautiful. I love you. Bye." "I'd like to thank the Russians for this wonderful docking," Bill Gerstenmaier, NASA's director of space operations, said earlier. "It is so great to have all six crew members on board the space station to get back into utilization and operations. They did a great job with the activities today, they looked easy but they really worked hard to make sure this launch was successful. "This will be an exciting period for the crew," he added. "They have many activities over the next several months, another Progress (cargo ship) launch, potentially the first commercial cargo vehicle for the U.S. and a very busy science program." Kononenko, Pettit and Kuipers originally planned to launch at the end of November, but the Russian crew rotation schedule was disrupted after a Progress cargo ship was destroyed during launch Aug. 24 when its third stage engine, virtually identical to the one used in the manned version of the Soyuz booster, malfunctioned and shut down before the craft reached orbit. An investigation concluded the shutdown was triggered by contamination in a propellant line. Engineers carried out extensive inspections of downstream engines and implemented improved quality control procedures before the Russian federal space agency successfully launched another Progress supply ship Oct. 30. The Soyuz TMA-22 carrying Burbank, Shkaplerov and Ivanishin was safely launched Nov. 13, about two months behind schedule. Today's docking came amid word that a Russian military communications satellite failed to reach orbit after launch from the Plesetsk space center north of Moscow, apparently because of a problem during the final phase of powered flight when the Soyuz 2-1b's third stage engine was firing. Anatoly Zak's Russian Space Web reported the third stage was driven by a new R-0124 engine, not the RD-0110 used in manned Soyuz rockets. While the failure is not expected to impact space station operations, it was another black eye for the Russian space industry and likely will raise fresh questions about quality control and program oversight. 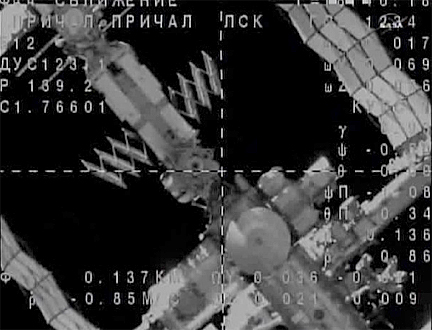 "This is a significant failure," Vladimir Popovkin, chief of the Russian federal space agency, said through an interpreter during a post-docking news conference. "This proves that this area of the space industry is in sort of a crisis. I can say even now the problem lies in the engine. But to be more certain we need to take a look at the telemetry and I believe that tomorrow we'll have results we'll be able to tell you about." Popovkin's predecessor, Anatoly Perminov, was forced out by Russian Prime Minister Vladimir Putin in April following high-profile failures that marred a year highlighted by the 50th anniversary of Yuri Gagarin's launch to become the first man in space. During Popovkin's tenure, the Russians lost a communications satellite in an August Proton launch failure and then the Progress supply ship a few days later. And in a major, still-unfolding failure, a $163 million Mars probe was left stranded in low-Earth orbit in November. The 14.5-ton Phobos-Grunt spacecraft is expected to plunge back into the atmosphere around Jan. 16. The Meridian launch was the fifth Russian space failure this year. "We do need to figure out what exactly happened," Popovkin said. "We need to start from this point and take certain measures." He then was asked if he believes "there is a problem inside the space industry given all these off-nominal situations and what measures may need to be taken." "Yes, there are problems," Popovkin said. "We need to modernize. Second, we need to optimize everything. ... Third, we need to optimize and modernize the tracking system because it's difficult to track and oversee everything, control everything. Once again, it's also aging of human resources given the troubles we had in the 90s. Quiet a lot of people left and nobody came to replace them." He said the average age of workers in the Russian space industry today is 43, but the "main bulk" of the personnel is either over 60 or under 30. "So we'll have probably to trust our young people more," Popovkin said. "It's probably time when we need to replace lots of leaders and heads."